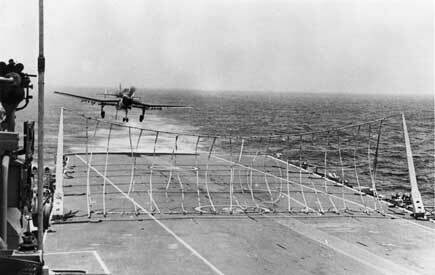 A Gannet approaches the barricade for an emergency arrest. 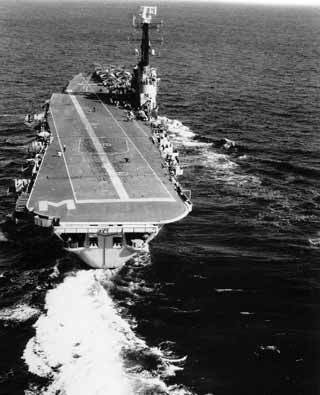 The angled deck was one of the three improvements to aircraft carrier design conceived by the Royal Navy that made fast-jet operations both possible and safe. The idea of canting or skewing the landing area to port of the ship's centreline had evolved from experiments with a rubber deck and Sea Vampire fighters without undercarriages in HMS Warrior in 1948. Although the rubber deck itself proved impractical, the 'skewed deck' as it was called at first was seen as a very effective way of making arrested landings safer on existing, relatively small, flight decks. 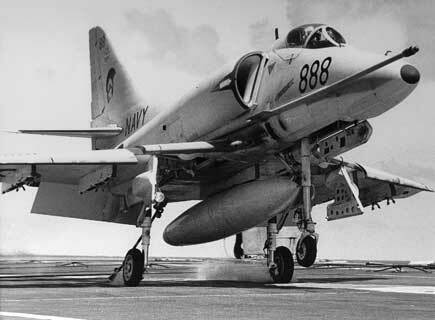 The generation of jets planned for the 1950s were much heavier than their predecessors, had higher landing speeds and would have needed most of the deck available to complete an arrested landing. The standard technique of centreline landings with a barrier to protect the deck park forward from aircraft that missed the wires was no longer tenable and, with little or no room for the deck park, the number of aircraft that could be operated was small. Worse still; if the whole deck had to be clear for every landing, the number of aircraft operated at any one time would be low and the speed with which they could be recovered would be slow. The angled deck solved this dilemma by providing a landing runway that was longer than the portion of deck aft of the existing barriers. The sum of the lengths of the landing and launch/parking areas was `greater than the length of the ship. Trials were carried out on an angled deck painted on HMS Triumph, on USS Antietam the first carrier actually fitted with a full angled deck in 1953 and in HMS Centaur the first British angled deck carrier in 1954. The trials were successful, so successful that every carrier navy moved to copy the idea quickly, led by the USN. Not only did the angled deck provide a longer runway in which the arrester wires could be moved nearer the centre of pitch to make landing easier in bad weather but other advantages soon became apparent. There was no longer a need for a barrier since, with clear deck space ahead of the wires, an aircraft that missed the wires, known as a 'bolter', could open the throttle to go round for another circuit. The area to starboard of the runway gave clear parking space for a number of aircraft, allowing rapid multiple aircraft recoveries and a deck park for refuelling and re-arming. Although simple in concept, the conversion of existing carriers to have angled decks involved structural alterations, loss of the armament and aerials mounted on the port beam. The arrester wire machinery had to be re-aligned to lie athwart the angled deck. Once the new structure was installed, it provided useful volume for mess decks and machinery. Three new aircraft carriers joined there respective fleets in 1955 with all three British improvements to carrier flying. 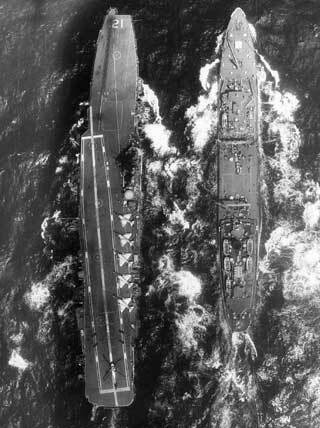 They were HMS Ark Royal in February, USS Forrestal in October and HMAS Melbourne (II) in November. The Australian ship was, therefore, one of the most advanced ships of her day despite her small size. A pilots view of Melbourne's angled flight deck. Melbourne's 5.5 degree angled flight deck.